Please join me in welcoming author, Phoebe Matthews to Conversations today. She's here to talk about her Mudflat Magic Series. So, check out the cover to the book set and blurb! 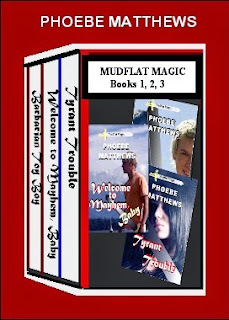 The Mudflat Magic series includes six novels, with the seventh a work in progress. Claire Carmody works two jobs in Seattle and barely manages to keep up with the bills. She lives in a neighborhood of families who have inherited magic, weak magic, but enough that a con man threatens to include her in an illegal scheme. Her attempt to escape lands her in greater danger, and one of the dangers is a cute guy. Well, those are always dangerous, aren't they? This year LostLoves BookClub combined the first three novels of the series in one volume, the ebook available from most distributors and the paperback available through Amazon. Also, the ebook version of the first title, Tyrant Trouble, is perma-free at Amazon, Nook, Sony, Smashwords, iBooks, and Kobo. Many UFs are very dark, grim, serious. As none of the novels of Phoebe Matthews contain these elements, it seemed appropriate to add the word "lite" to her works, classifying them as urbanfantasylite. Not "light" as in enlightening, "lite" as in beer, entertaining. Skol! Phoebe Matthews lives in the Pacific Northwest and is currently writing three urban fantasy series. 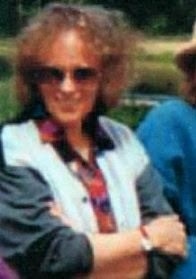 Her backlist includes novels published by Avon, Dell, Holt, Putnam, and Silhouette. Connect with Phoebe on her website: phoebematthews.com.